It has been almost 14 months since my last post here. Time truly flies when we follow what is close to our heart. I still do work on bikes and scooters but 2 years ago I booked myself for test drive in Tesla Model S and could not stop thinking about the power, silence and unbelievable acceleration of electric motor ever since. There is approximately 2000 moving parts (less in motorcycles) in Internal Combustion Engine or ICE car as opposed to around 17 moving parts in EV or electric vehicle. As I have been working on motorcycles for 33 years now I understand what is more reliable and less likely to fail. To make long story short over a year ago after I spent 12 months on Electric Car research online and offline I established Tesla Owners and Fans Brisbane community group to grow community of EV enthusiasts and get ready for electric transportation revolution that is happening all over the world already. You can find us and join us on Facebook HERE. 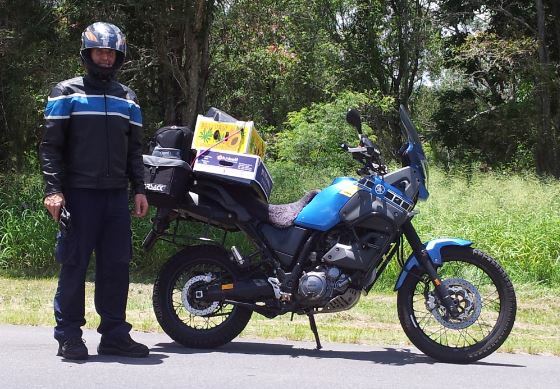 I still ride my Yamaha XT660 Z Tenere (currently at 120,000kms) more than I drive car but would love to find Electric Motorcycle that would replace my Tenere. It would have to be similar size with off road capabilities as great as those of Tenere. Do you know of such Electric Motorcycle? Please let me know if you do. I am getting tired of noise, vibration, pollution and gear shifting so Electric motorcycle of Tenere size would be amazing. If renewable energy solutions, battery storage or Electric Cars are the topics that interest you and which you would like to explore further as alternatives to ancient and dirty technologies like coal, petrol or diesiesel (fossil fuels) you are welcome to subscribe to my Youtube Channel HERE to stay tuned in and connected. It is free. In case you know someone who would appreciate a joyride in Tesla Model S and who lives along Bruce Highway between Sunshine Coast and Cairns or Port Douglas tag them here below or get them to contact me via comment under the video on Youtube please. We are driving up the East coast tomorrow, Monday 12th November 2018 and will be happy to meet them and provide them with short Tesla experience. More details in short video below. Have a great week guys and stay safe. I will be back and available on 28th November in case you need service or repair done to your beloved motorcycle or scooter. I am visiting my parents, friends and family at my birthplace in old mining town called Gelnica in eastern Slovakia, Europe Just to keep myself in shape I am helping my friend with his 1996 Honda NX 650 Dominator that has starter clutch worn out so it’s not entirely holiday. Below is my first 2 wheels with engine in the form of moped Stadion S22 built in 1960. I started riding this moped when I was 10 years old in 1985. This little baby is so much fun. My friend Colleen was visiting us at Easter and she mentioned that they were going camping at Noosa North Shore beach. It caught Hana’s attention and she said to me “LET’S GO TO NOOSA NORTH SHORE!” Fortunately Hana forgot how far Noosa is and we went on motorbike. Rode 45km on the beach 23 of which were in the dark on the way there at night. It was pretty spooky especially as it was my first riding in sand with a pillion passenger. Hana absolutely loved it. I visited beautiful Brookfield this morning where I serviced to quad bikes – Yamaha Big Bear 350 and Suzuki 250. It was at picturesque acreage up in the hills. Really nice couple who own these quad bikes use them around cattle and have lots of mango trees there which are loaded with mangos. I was very grateful to them for being able to pick one and a half boxes of this delicious fruit that I love. It’s my eleventh year in Australia and today is a special day for Jawa enthusiast like me. Growing up with these motorcycles made me appreciate them more and more. 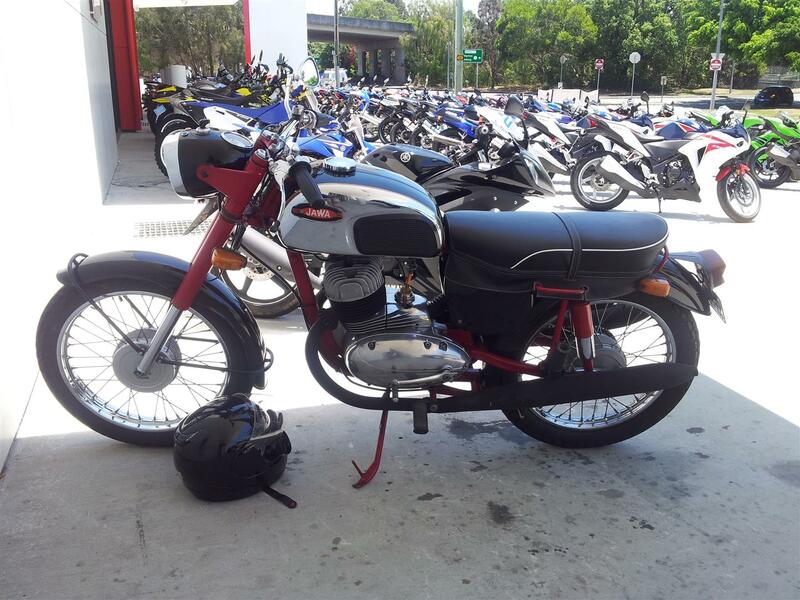 As I was ready to leave Team Moto Yamaha Enoggera today I spotted this Jawa 350 parked outside. I took some photos of it straight away and went back inside to look for the owner as I did not want to miss the opportunity to speak to the owner of the first Jawa that I found in this country apart from the ones that I found for sale in motorcycle magazines. I went inside and it was the third person that I asked that said: “Yes that’s my Jawa out there!” YESSSS! – was my thought. It was great meeting you Gerard (if you are reading this post). He has been looking after this Jawa very well for many years and he lives just round the corner from me too. 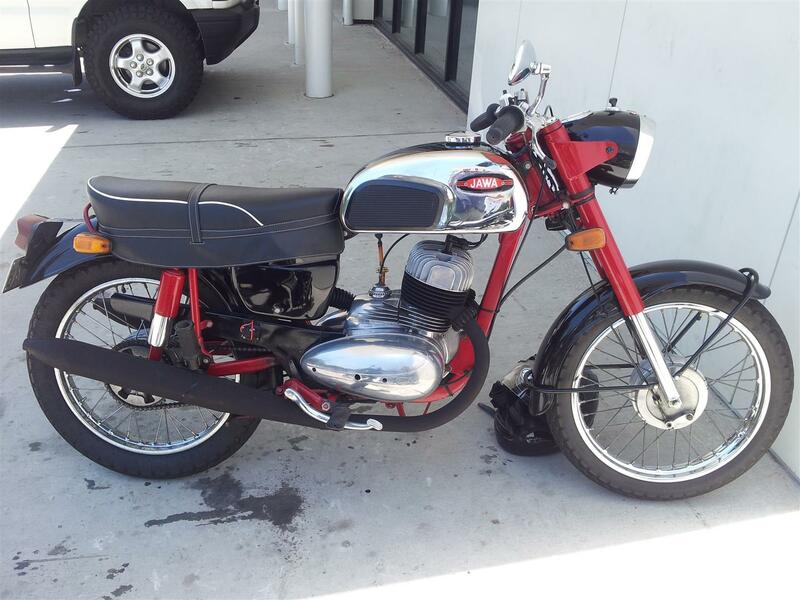 I am looking forward to some Jawa rides in Brisbane soon. It has been almost 18 months since my last post here. That’s hard to believe and here I am after very eventful year and a half. I have moved from Ashgrove to Everton Park and have settled in our beautiful new home very well. It is such a joy to be able to use skills and creativity that I have gained from my parents. Thank you Mum and Dad. I am so grateful for what you have taught me as it helps me a lot in transforming my front and backyard and also in building experience. Another year has passed and we have already put up a new calendar for 2012 that has been expected with so much anticipation in many ways. Now is the time to make your New Year 2012 even better, brighter and more ambitious by planning ahead and implementing changes that have been on your mind for so long. I am certain that if you make a commitment to changing 1% a day you will begin to see the results of your action taking in no time. Remember that 1% a day is 100% in just over 3 months and 365% difference in just one year. Below is a short video – highlights of my recent 2 day solo sand adventure to Rainbow Beach and Fraser Island that I wanted to share with you. Please leave your comments below this post. Motorcycle means and represents freedom on two wheels to me and that’s why the name of this website is www.FreedomOn2Wheels.com Check out “10 Insider Secrets of a Safe Motorcycle Rider” and much more. Those of you who have been to Fraser Island will certainly agree with me when I say that it is one of the most beautiful places in Australia and in the world. It is a destination on the list of places to visit for every tourist coming to Australia. Fraser Island is the world’s largest sand island and is very unique with its fauna and flora. I went to Fraser Island for the first time in 2004 and kept revisiting ever since. It is nice to get there in a 4WD vehicle but when I spotted a couple of bikes during my first visit there I couldn’t stop thinking about getting there on 2 wheels. After 6 visits in 4WD that idea finally became a reality a week ago. Monday morning 31.10.2011 came and I rode 134km from Ashgrove to Tewantin (near Noosa) on the Sunshine coast and from there onto the barge across the Noosa river. Right there at Noosa North Shore starts Great Sandy National Park. It is a truly beautiful place to visit regardless of an opportunity to drive/ride on the beach. From there it’s 55km of wide beach riding to Rainbow Beach. This route via beach makes the trip between Eumundi and Rainbow Beach 50km shorter comparing to having to drive through Gympie. Please note that beach riding and driving (4WD only) in this area is only allowed 2-3 hours on either side of LOW TIDE. Check the times of low tide online or at one of the offices of QPWS. (Queensland Parks and Wildlife Services) It is approximately 45km of wide compacted sand to Double Island with the lighthouse where you get inland to avoid impassable rocky area. From there back onto the beach and another 10km until you reach Rainbow Beach. The road rules apply and speed limit is 80km/hour unless signed otherwise. Police patrol these beaches and I have met police car there a few times. Then from there it is just 12km to board the barge at Inskip Point. I was on my own and therefore it made me realise how important it was to stay safe and not having to rely on anyone else’s help in regards to lifting the bike from sand or on water and food supplies for 2 days. Well, you don’t need that much for 2 days, do you? It was not too hot, neither too wet – just right. It has been a great 2 day adventure without any back up vehicle and any help whatsoever. Very fine soft silica sand and many sand blows were really tiring and very rewarding. I absolutely loved it. Being solo allowed me to make lots of video footage (video diary) and many photos. I’ve covered a distance of 310km on road and 250km in sand Off road. Three times I laid 200kg bike gently into the sand and 3 times lifted it up within 10 seconds to prevent fuel from leaking out of the tank. :o) No damage and no single scratch to me or the bike. Follow through to what you want and desire. This has been on my “wish” list for quite some time. What is it specifically that you are going to do and reward yourself with in the near future? Stay tuned for a video with “SAFE IN SAND” riding tips coming soon.